Hailing from Stockholm Sweden, Million Stylez is one of the hottest reggae and dancehall artists coming out of Europe today. With the international hit Miss Fatty as well as two albums From A Far and Everyday, there are very few dance floors over the world that could've missed him. And with a lyrical diversity holding truth to his name, his releases include roots and culture hits such as World Crisis, Love We A Deal With, Jah is Worthy and Born In The System– as well as the dancehall bangers Millie Swagga, Summertime, Frenemy, Bun A Badmind and featured alongside Busy Signal on As Mi Forward. Having toured the entire globe, Million Stylez has established himself as a top ranking live performer - and continues to grow his fan base wherever he goes. And for the very first time, it will be Australia's turn to witness the million styles of the one Million Stylez! 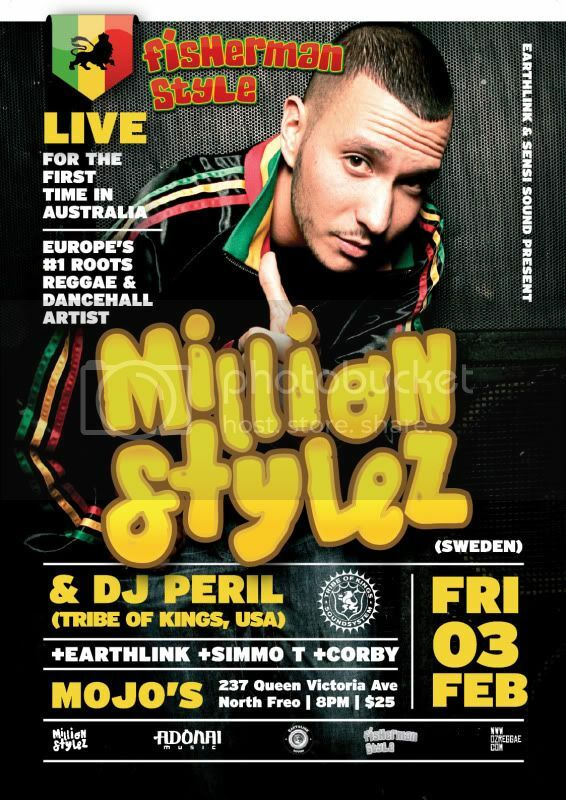 Support by Earthlink, DJ Corby and Simmo T.
Friday 3rd February, Mojo's Bar North Fremantle. 8pm - 1am. $25 on the door, no pre-sale tickets so make sure you get down early for what is sure to be one massive night of Reggae music!!!!!! Here's a nice mix to enjoy before the show next Friday. Get it here.